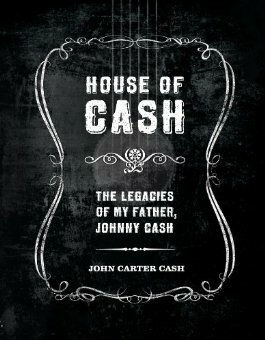 House of Cash is an unprecedented look at the life and inspirations of the Man in Black, by none other than his son, John Carter Cash. Gathering together previously unpublished photographs, lyrics, art, notes, and recollections from the Cash family archives, John Carter paints a portrait of his father’s rich inner life, exploring his creative spirit, his inspiring persistence, and the values he imparted to his son and family. A record of a deep and ongoing conversation between father and son about what matters in life, House of Cash explores Johnny Cash’s drive to live deliberately as he worked to determine his values, share them with those close to him, and reaffirm them on a daily basis. This intimate exploration of the personality and legacy of Johnny Cash, is a unique portrait of a deeply spiritual, creative, and passionate soul whose music sprang from the way he lived. This isn’t an autobiography of Cash. It is a son writing about his family and his father-who also happens to be a singer/songwriter of some of the best country and gospel music of the Twentieth Century. This book is not so much about Cash the artist, but really about Cash the man and father. The perspective that John Carter Cash brings to this reflective look at his father is heart-warming, yet both interesting and informative. But it’s the many photos, both colour and black & white, that really gives insight into Cash and his life. You can find further details of House of Cash on the main catalogue, available in ‘Catalogues’ on the Library’s website.